Finding a place in God's global mission isn't just something students are supposed to do . . . Since 1946, God has gathered generation after generation of students to Urbana. Through it, he reveals his glory and heart for the world and his bigger plan for their lives. He’s sent them out to be his hands and feet, consecrated by the Spirit, and equipped with special gifts and passions. Preaching the Gospel, defending the oppressed, redeeming creation, mending the broken-how will God call your students? Where will he call them? 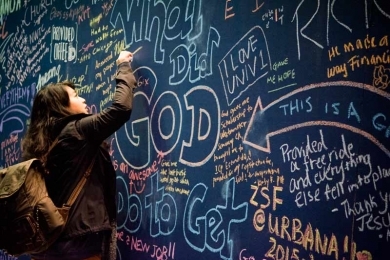 Invite your students to be part of Urbana 18. Recent Barna studies revealed that "51% of churchgoers don't know of the Great Commission." As pastors and church leaders, you play a crucial role in shaping your congregations' missional life and calling. Join other pastors and church leaders at Urbana 18 for five days filled with inspiration, insight, and opportunities to serve God's global mission. The Ministry and Missions Leadership (MML) track is designed to help you contextualize Urbana's message to fit your ministry. Find out how you can lock in the super early bird registration price for your church group.